Adding some paneer balls and paneer cubes in your average veg friendrice gives a yummy looks and delicious taste on the Paneer fried rice. Check out the recipe from The Masala Route. I did not use any vegetables in Paneer fried rice but it is good if you add some vegetables (carrot, bean, cauliflower etc.) into the fried rice to make it more delicious. 1. 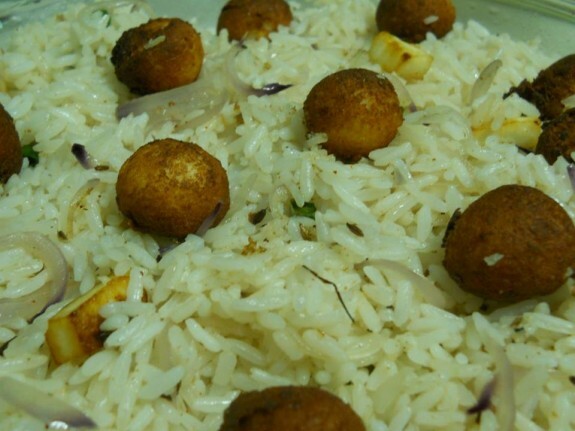 Cut paneer pieces in small cube s. Also smashed little paneer and make some of them in small shaped paneer balls. 2. Toast the panner cubes and paneer balls in oil. 3. Drain the excess oil in tissue paper and keep it aside. 4. In a pan heat oil and add cumin seeds. When the seeds get cracked add onions and sauté it for few minutes until light brown in colour. 5. Add chopped garlic and sauté it. Then add green chili chopped, salt, pepper powder, chaat masala powder, cumin powder and stir it well in low flame. 6. Add paneer cubes and mix it. 7. Add cooked basmati rice and mix it well. Now add ½ of the fried paneer balls and mix well. Remove it from the heat. 8. Garnish it with rest of the paneer balls.